This evening, great is our joy to meet with you here in Lviv for this new step in the pilgrimage of trust on Earth. For a very long time, a deep friendship has united us with so many Ukrainian Christians, so many of whom come and participate in the international meetings in Taizé or elsewhere in Europe. We rejoice that now we can, in our turn, be welcomed by you. 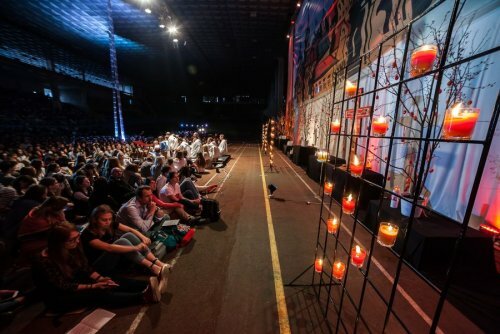 This first Taizé meeting in Ukraine was made possible by the blessing of the Churches, the remarkable support of the mayor and the municipality of Lviv, the trust of the people who will welcome you into their homes, and also by the personal commitment of more than 300 young volunteers. To everyone, thank you from the bottom of our hearts. The Gospel that we heard this evening tells that the Risen Christ came to his disciples, “when the doors were closed”. And he said to them, “Peace be with you”. The resurrection of Jesus enables him to come and meet us even if our inner doors are closed. The resurrection opens a new horizon before us. It assures us that violence and death do not have the last word. This may be true in our personal lives, but the Risen Christ also calls us, all together, to be witnesses of his peace in the human family across the world. In these next days, we will pray for peace – in our hearts, in our families, in our countries and, in particular, peace in this much-loved land of Ukraine. After this first prayer, each of you will be setting off toward your host families or communities. Let us rejoice that doors are open to welcome us! It is essential in our societies, often marked by growing distrust, that we can have this simple experience of trust. This experience of hospitality is an essential part of what we will live in the following days. Christians have always been called to open their doors: “don’t forget hospitality, for by it some have welcomed angels without knowing it” (Hebrews 13,2). For the first time in such a meeting of young people, we will have morning prayer with those who welcome us, in their homes. In the meeting booklet there are some indications to help you with this time of prayer together in the best way possible. This will be like a subtle reminder of the time – not so long ago – when faith here was only able to be shared in secret, in houses, by the hidden but persevering practice of a few people. Therefore, by welcoming and being welcomed, we will transmit to one another the hope that we receive in faith: by his resurrection, Christ has opened a way of life on the earth. So, let us care for one another! Our meeting in Lviv will then be a landmark on the way toward trust. These women came to the tomb to express their grief, and yet, while facing the hatred, pain, and death they had witnessed, they also had an expectation, confused, hardly expressed, but that nonetheless stayed with them: the expectation that the love which Jesus had told them about would be manifested. The evangelist recalls the tears of Mary of Magdala. Like her, it can happen that we feel overwhelmed by the suffering that weighs upon us in our personal existence and in the face of evil, violence, and war. During these days, the presence of children and families from the Donbas reminds us of the pain of so many people who have had to abandon everything or mourn the death of a loved-one, because of the war that has been tearing apart the East of Ukraine for the past three years. Coming back to Easter morning, we can in our turn live the experience that these women had at the tomb: risen, Christ is there and comes to us, but he comes in an unexpected way, not triumphantly, but very humbly. And like them, we can also grasp that he is alive, though in a mysterious way. Sometimes we can feel his presence, but not always. It is by trusting in him that we welcome him. Invisibly, Christ comes close to each one of us, and he communicates to us a new life that is love, a love stronger than death and evil. And, as he did for the women at the tomb, Christ also invites us to communicate around us the mystery of his presence – he would like to come especially to those who are without hope and give them new life. In the Gospel reading that we heard yesterday at midday, Christ entrusted his mother to his disciple and his beloved disciple to his mother. If we put ourselves in the place of this friend of Christ, we too receive in Mary a mother. And through her we are brothers and sisters. And also, when Mary of Magdala goes to the tomb on the first day of the week, , Christ sends her to announce to his brothers the good news of his resurrection. To his brothers, he says. So, these two stories have in common this new reality of a universal fraternity in Christ. Are we conscious enough of the extraordinary consequences that this new reality implies for us, in our own existences that are sometimes shaken, and also in the historical divisions of our Christian communities? Yes, the risen Christ makes us sisters and brothers. May these days together give us a foretaste of this fraternity in him. Like the apostle Thomas after the resurrection, our trust in God is sometimes overshadowed by doubt. Within ourselves, doubt is not necessarily negative. It can keep us alert. However, there is a doubt that paralyses or undermines trust. It is certainly the reason why Christ calls those who believe without having seen ‘happy’. His presence as the Risen Lord opens our eyes and enables us to find a new way of looking at the realities that make up our lives, a look of hope and of trust, a look that transforms us. This evening, I would like to mention two of these transformations. A first transformation that comes about in us through the resurrection of Christ is the way it makes us discover that every human life has a meaning, even the poorest and the most deprived. This is true since the very beginning of life and it is true for every life without exception, even in the life that seems the most pointless, like that of someone who is very ill. The Risen Christ comes close to all, even to the lowest of the low. This is the trust of our faith. To lack this trust would be to lack trust in the meaning and direction of our own lives, with their fragilities. A second consequence of the resurrection of Christ is that wounded human relationships can be healed. Jesus did not condemn the people who arrested him, nor his disciples that abandoned him, nor the soldiers that killed him. His life, his death, and his resurrection are an invitation to forgiveness. Risen from the dead, Christ calls down peace upon his disciples. He invites us to search to live in peace of heart, so that together we may be a sign of his peace in the world. He gathers us from all peoples, even those opposed to one another, from all languages, from all human conditions, in order to be bearers of his peace. In certain life situations, it can seem that forgiveness is impossible. To those who have lost a loved-one by a sudden death, or because of violence and war, I would like to say: your pain and – perhaps – your inability to forgive are truly understandable. Christ comes to be with you, there where you are, to open little by little, in your hearts too, a path of peace. Today, we all know that many of those around us find it difficult to believe in the resurrection. And this faith is all the more challenging when we remain alone. 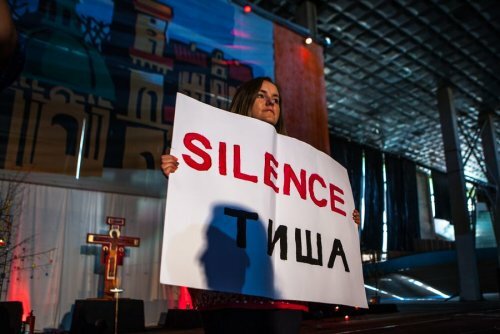 But by being together, as we are here in Lviv, we can lean on the faith of other Christians. On this last evening of our meeting in Ukraine, I would like to express again our deepest gratitude to the Churches and to the city and region of Lviv. I would also like to say once again, to all those who opened their doors, just how much this gesture touches us. Yes, your country is going through real hardships, but that makes the hospitality we have received all the more significant. These last days, we have met and listened to young people of Ukraine. In my turn, I would like to tell them all again this evening: you transmit through your lives a message of hope, through your caring trust, and through the living faith which is yours. In the streets, we have seen people of every age make the sign of the cross near to a church or before a cross. We have also prayed with the host families in the morning, as a subtle reminder of the time – not so long ago – when faith could only be shared in secret, in the hidden but persevering practice of a few people. Trust in the infinite love that God has for each person, for every one of us, is the source of human solidarity. It is starting from this source of love that the Gospel invites Christians, together with those who search for peace, to live a life of solidarity. For us brothers, one of our greatest desires is that you all may discover this source of life. It is the Holy Spirit, present in us, who brings springing up in our hearts the source of love and peace. Faced with all that discourages us – the violence in the world, our own weaknesses and imperfections, and even our faults – in the face of all this, may we have the courage to simply say yes to his presence. This “yes” may be hesitant and hardly perceptible, but it creates an openness in us. And the peace received in the secret of our hearts can lead us far, in a life rooted in God and open to all those entrusted to us. And now, Ilczyk will name some of the countries which are present among us (...). Tonight I would like to greet one person who is among us, Pan Miroslav. He is the grandfather of Roman Hurik, one young Ukrainian who died, at the age of 19, on Maidan Square during the Revolution of Dignity. We pray tonight for his memory. Let us continue now with the singing and see you tomorrow morning, at 9.30, for the final prayer of our meeting in Lviv. Feel free to invite your host families to join! We will tell them together our great gratitude. This morning, we are gathered for a last meeting at the end of these five days in Lviv. As some of our hosts have accompanied us here this morning, let us say again a very big thank you for their beautiful hospitality that has gladdened our hearts these past days. Before we say goodbye, I would like to say a few more words. Every Sunday in Taizé, we spend half an hour together in our Church of Reconciliation for a time of silent prayer for peace. Among the many situations in the world that call out for prayer, I would like to say to the young people of Ukraine: we are keeping your country in our prayer. Over the next months, the pilgrimage of trust will continue in different places. 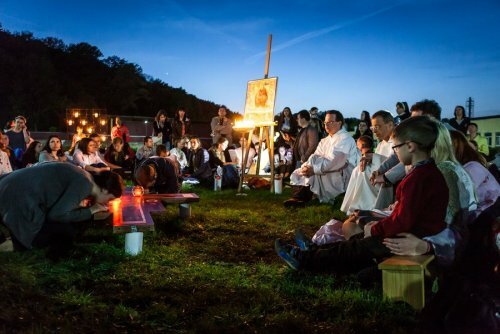 You are all welcome in Taizé during the summer and also throughout the year. From August 19th to 26th, there will be a week of reflection for 18 to 35 year-olds. Before that, we will go with some 25 young people to take part in the Orthodox celebrations of the Ascension in Siberia, in the city of Kemerovo, which was recently rocked by a fire in a commercial centre. I take this opportunity to warmly greet the young people from Russia who are among us. Then we will have other meetings: Hong-Kong in August, Graz in October, Madrid in December for the European meeting, and then in 2019, in Cape Town, South Africa. You know that this “pilgrimage of trust” is not organised around any one particular place, rather it reminds us of the “journeying” aspect of our lives: in the image of Jesus himself, our home is not of this world. Already in the early days of Christianity, this intuition was present when Christians remembered that they were “the soul of the world” and that they “spend their lives on earth, but are citizens of heaven” (Letter to Diognetus V,9). However, this pilgrimage of trust is indeed on the Earth… on this Earth where we live and where we are called to engage our liberty and exercise our responsibilities. So, each and every one of us might take the time to ask themselves this morning: how to continue, once back home, a concrete commitment in the service of others? Where is God waiting for me? May each and every one of you have a safe journey home! Христос Воскрес - Christ is risen!